The District of Kitimat has issued a boil water advisory. Due to the significant rainfall, water entering the District of Kitimat’s system is turbid. The District is still treating water, however, until further notice, boil water for 2 solid minutes before using it for cooking or drinking. The District of Kitimat is working with Northern Health on this matter. The third and final disturbance in this series of storms will approach the North and Central Coasts on Sunday. An intense low is forecast to track west of Haida Gwaii as moves northward. Southeast winds up to 100 km/h will develop over Haida Gwaii midday Sunday and then spread to the North Coast – Coast Sections and Central Coast – Coastal Sections in the afternoon. Winds will diminish Sunday evening as the low moves away from the region. High winds may toss loose objects or cause tree branches to break. The Environment Canada web page says Kitimat received 24 mm of rain in the 24 hours preceeding the forecast at 2039 on Saturday. Showers. Amount 10 to 20 mm. Windy this evening and after midnight. Low 8. Sun, 11 Oct Showers. Amount 5 to 10 mm. Wind becoming south 40 to 60 km/h late in the morning. High 10. Night Showers. Amount 20 mm. Wind south 40 to 60 km/h becoming light near midnight. Low 8. Environment Canada is cutting its Compliance Promotion and Enforcement, marine pollution and emergency response budgets over the coming years, raising questions when cuts to other federal departments are added in, about just how the department can continue to operate, much less enforce the 209 conditions that the Joint Review Panel has laid down for the Enbridge Northern Gateway project, not mention future projects connected with LNG and mining in the northwest. Environment Canada and other departments suffered cuts in the 2014 budget. Now Environment Canada has posted its spending estimates on its website. A table published on the site shows that Environment Canada spent $17,467,430 on compliance and enforcement in fiscal 2011 to2012; $16,695,292 in 2012 to2013. It estimates spending a little more in 2013 to 2014, $16,725,035; then comes a steady drop $15,821,926 for 2014 to 2015; $15,321,593 for 2015 to 2016 and $15,356,059 for 2016 to 2017. Environmental Emergencies comes under the Substances and Waste Management division, with most of the department’s concentration on “substances management” and “effluent management.” Despite the probable growing threat to the environment from marine pollution and the possibility of a marine disaster from a tanker plying the northwest, the overall budget for Substances and Waste Management is also shrinking; from $83,291,322 in 2011 to 2012, $79,295,781 in 2012 to 2013. $76,209,841 for 2013 to 2014, $75,747,789 for 2014 to 2015 and $73,834,432 for 2015 to 2016. The budget cuts take effect just as the Enbridge Northern Gateway project, if it gets a final go ahead and the LNG projects begin to come on stream. Overall Environment Canada will spending from $1.01 billion in 2014 to 2015 to $698.8 million in 2016 to2017. In addition, Environment Canada’s list of strategic priorities has absolutely no mention of either monitoring and enforcing pipeline conditions nor protecting the British Columbia coastline. Promote compliance with and enforce wildlife acts and regulations. Another area where the budget has been cut is in climate change monitoring. It was those cuts that garnered the most reaction, from the mainstream media Toronto Star, Environment Canada braces for cuts to climate programs to the environmental site, Desmog Canada, More than 1000 Jobs Lost, Climate Program Hit Hard in Coming Environment Canada Cuts. As is the case for all organizations, Environment Canada faces uncertainties in meeting its objectives. These uncertainties create opportunities and risks with potential to positively or negatively affect program results and outcomes. Uncertainties include those driven by external environmental factors, such as dependencies on partners and stakeholders, changing regulatory and legislative requirements, increasing Canadian and international expectations concerning the management of the environment and the continuously increasing pace of advances in science and technology. The 2015–16 decrease is explained by the reduction in funding for the SDTC Foundation and the sun setting of temporary funds. In 2016–17, the decrease in funding is explained by the sun setting of funding for temporary initiatives. Sun setting programs are subject to government decisions to extend, reduce, or enhance funding. Outcomes of such decisions would be reflected in the Department’s future Budget exercises and Estimates documents. In other words, Environment Canada is becoming more dependent on partnerships with private companies and foundations to help provide funding for what the government should be doing and it is allowing for the politicians to introduce new temporary programs, probably just before the election, to make it look green. The Haisla Nation have filed a challenge to the Northern Gateway Joint Review Panel with the Federal Court of Appeal requesting that court quash the JRP findings. The Haisla suit comes at a time that a coalition of environmental groups and the Gitxaala Nation are asking for court reviews of the JRP. 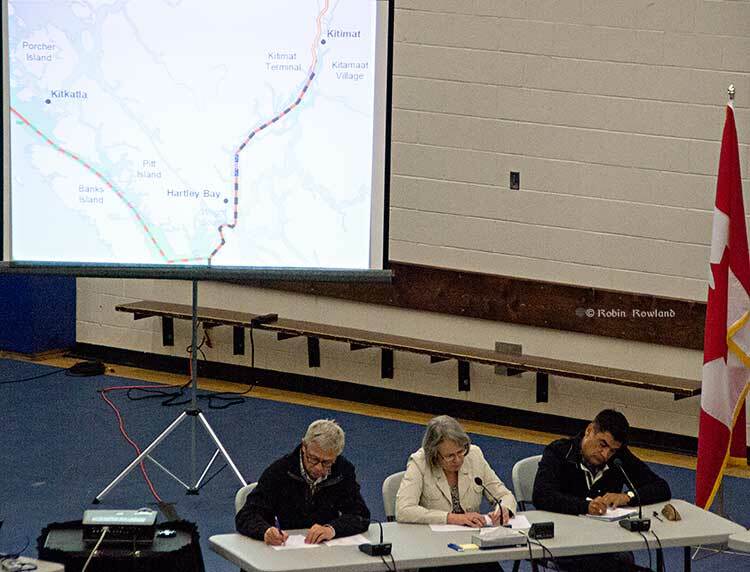 The court challenge also comes at time when the District of Kitimat Council has maintained its position on an April 12 plebiscite asking the residents of Kitimat if they approve of the Joint Review Panel’s findings on the Northern Gateway project. Late Wednesday, the Gitga’at Nation at Hartley Bay also announced they are challenging the JRP. that the JRP report “as issued on December 19, 2013, does not contain the recommendations required” under the Canadian Environmental Assessment Act. fails to justify its conclusion that, after mitigation, the likelihood of significant adverse effects resulting from the project malfunctions is very low. concluded that the project is in the public interest. failing to fully consider the submission of the Haisla Nation on potential conditions for the project. The challenge also deals with the issue of cultural modified trees, especially the JRP’s finding that “impacts to Haisla Culturally Modified Trees can be mitigated” and by concluding “that impacts to Haisla Nation Culturally Modified Trees can be mitigated by including a condition that Northern Gateway file a plan to protect and manage post-1846 CMTS.” The part of the challenge dates back to time when Enbridge surveyors entered Haisla traditional territory without permission and as part of the survey cut down or damaged cultural modified trees. On the afternoon of January 22, the Gitga’at Nation at Hartley Bay also announced they were filing a challenge to the JRP. The application states that while the Gitga’at are resilient, they are also highly vulnerable to threats to their local ecosystems and community well being from impacts cause by increased tanker traffic. The negative impacts to Gitga’at society, culture, identity, health, and economy will only increase in the event of an oil spill, with the impacts increasing with the size and consequences of the spill. Traditional foods harvested from the sea comprise the largest portion of the Gitga’at diet. On January 16, Ecojustice lawyers, representing ForestEthics Advocacy, Living Oceans Society and Raincoast Conservation Foundation, filed the lawsuit seeking a court order to prevent Cabinet from relying on the flawed JRP report to approve the proposed pipeline. Ecojustice argued that the JRP panel also failed to meet legal requirements under the Species at Risk Act when it decided to not consider the final recovery strategy for humpback whales, and failed to identify mitigation measures that would reduce the impacts on caribou. The humpback whale recovery strategy identifies toxic spills and vessel traffic as two threats to the iconic species’ survival and recovery — all relevant information that should have been considered during the review hearings. Fisheries and Oceans signed the agreement with the National Energy Board in mid-December. DFO says there is little difference between its agreement with the NEB and collaborative agreements with the provinces. Fisheries and Oceans Canada has established a collaborative agreement with the National Energy Board that will help eliminate overlap and duplication during regulatory reviews while maintaining a strong regime to manage threats to fish and fish habitat. Fisheries and Oceans Canada remains responsible for fisheries protection, including the issuance of Fisheries Act authorizations. Our collaborative arrangement builds on the decades of training, experience and expertise of NEB biologists in assessing the potential environmental impacts of development projects, including regarding fish and fish habitat. • More efficient approval processes. The Policy and Operational Guidelines that are followed by DFO staff and anyone else involved in these matters are available on Fisheries and Oceans Canada’s website. The National Energy Board is best placed to deliver regulatory review responsibilities under the Fisheries Act for activities relating to federally regulated energy infrastructure (such as pipelines). • Assess the acceptability of proponent offsetting plans when authorization is required. Over the years, DFO has established similar arrangements with some Provinces and with Conservation Authorities. In all cases, the standards for fisheries protection are established by DFO and the Fisheries Act Authorizations continue to be done by DFO. Skeena Bulkley Valley MP Nathan Cullen says at least two of the Northern Gateway Joint Review Panel’s 209 conditions may already be outdated. The $1.035 billion figure was contained in Enbridge’s American arm, Enbridge Energy Partners, latest filing for the third quarter over 2013 with the US Securities and Exchange Commission. Cullen is referring to a study by Environment Canada Emergencies Science and Technology,Fisheries and Oceans Canada Centre for Offshore Oil, Gas and Energy Research and Natural Resoures Canada on bitumen that was completed in November and released this week.
. The two diluted bitumen products display some of the same behaviours as conventional petroleum products (i.e. fuel oils and conventional crude oils), but also significant differences, notably for the rate and extent of evaporation. The Panel acknowledges the variety of opinions from experts regarding the behavior and fate of oil spilled in aquatic environments. These experts generally agreed that the ultimate behavior and fate of the oil would depend on a number of factors, including the volume of oil spilled, the physical and chemical characteristics of the product, and the environmental conditions at the time. The Panel finds that likely oil behaviour and potential response options can be predicted from knowledge of the type of oil spilled and its physical and chemical characteristics. Details of oil behaviour and response options cannot be specified until the actual circumstances of a spill are known. The Panel is of the view that, if placed along a spectrum of: tendency to submerge; persistence; and recovery difficulty, dilbit would be on the higher end of the spectrum, similar to other heavy oil products. The Panel accepts evidence from previous spills showing that, in response to circumstances at the time, the behaviour of heavier oils, including conventional oils and synthetic crudes, can be dynamic. Some oil floats, some sinks, and some is neutrally buoyant and subject to submergence and overwashing. Although the project would transport different types of oil, the majority of the evidence presented during the hearing process focussed on whether dilbit is likely to sink when spilled in an aquatic environment. In light of this, the Panel has chosen to focus its views on dilbit. The Panel heard that the fate and behaviour of dilbit has not been studied as much as that of other oils. Although there is some uncertainty regarding the behavior of dilbit spilled in water, the Panel finds that the weight of evidence indicates that dilbit is no more likely to sink to the bottom than other heavier oils with similar physical and chemical properties. The Panel finds that dilbit is unlikely to sink due to natural weathering processes alone, within the time frame in which initial, on-water response may occur, or in the absence of sediment or other particulate matter interactions. The Panel finds that a dilbit spill is not likely to sink as a continuous layer that coats the seabed or riverbed. “It hasn’t even been a month since the JRP released their 209 conditions, and it seems like we’re already seeing some of them become obsolete,” Cullen said. The Joint Review process was set up to deliver a positive verdict, according to Cullen, regardless of what the real life case studies in Michigan had already shown. “To say that it won’t cost as much – if not more – to respond to a spill in a remote corner of northwestern BC during winter than it was in Michigan in the middle of July is ridiculous,” Cullen said. “What’s even more astonishing is that we asked repeatedly for these studies on the behaviour of diluted bitumen in the marine environment to be part of the Joint Review Panel’s assessment. That the government waited until after the JRP had given its conditional yes to release these findings is not only appalling but also highly suspect. Many people and parties commented on the economic benefits and burdens that could be brought about by the Enbridge Northern Gateway Project. In our view, opening Pacific Basin markets wouldbe important to the Canadian economy and society. Though difficult to measure, we found that the economic benefits of the project would likely outweigh any economic burdens. The Province of British Columbia and many hearing participants argued that most of the project’s economic benefits would flow to Alberta, the rest of Canada, and foreign shareholders in oil and pipeline companies. They said British Columbia would bear too many of the environmental and economic burdens and risks compared to the benefits. Northern Gateway said about three-quarters of construction employment would occur in British Columbia, and the province would get the largest share of direct benefits from continuing operations. It does touch on the “burdens” faced by the Aboriginal people of northern BC and others in the event of a catastrophic spill. In the unlikely event of a large oil spill, we found that there would be significant adverse effects on lands, waters, or resources used by Aboriginal groups. We found that these adverse effects would not be permanent and widespread. We recognize that reduced or interrupted access to lands, waters, or resources used by Aboriginal groups, including for country foods, may result in disruptions in the ability of Aboriginal groups to practice their traditional activities. We recognize that such an event would place burdens and challenges on affected Aboriginal groups. We find that such interruptions would be temporary. We also recognize that, during recovery from a spill, users of lands, waters, or resources may experience disruptions and possible changes in access or use. We recommend approval of the Enbridge Northern Gateway Project, subject to the 209 conditions set out in Volume 2 of our report. We have concluded that the project would be in the public interest. We find that the project’s potential benefits for Canada and Canadians outweigh the potential burdens and risks…. We are of the view that opening Pacific Basin markets is important to the Canadian economy and society. Societal and economic benefits can be expected from the project. We find that the environmental burdens associated with project construction and routine operation can generally be effectively mitigated. Some environmental burdens may not be fully mitigated in spite of reasonable best efforts and techniques…. We acknowledge that this project may require some people and local communities to adapt to temporary disruptions during construction. The environmental, societal, and economic burdens of a large oil spill, while unlikely and not permanent, would be significant. Through our conditions we require Northern Gateway to implement appropriate and effective spill prevention measures and spill response capabilities, so that the likelihood and consequences of a large spill would be minimized. It is our view that, after mitigation, the likelihood of significant adverse environmental effects resulting from project malfunctions or accidents is very low. We find that Canadians will be better off with this project than without it. In the Joint Review ruling is one fact. Northern British Columbia must bear the “burden” of the Northern Gateway project for the good of Alberta and the rest of Canada. 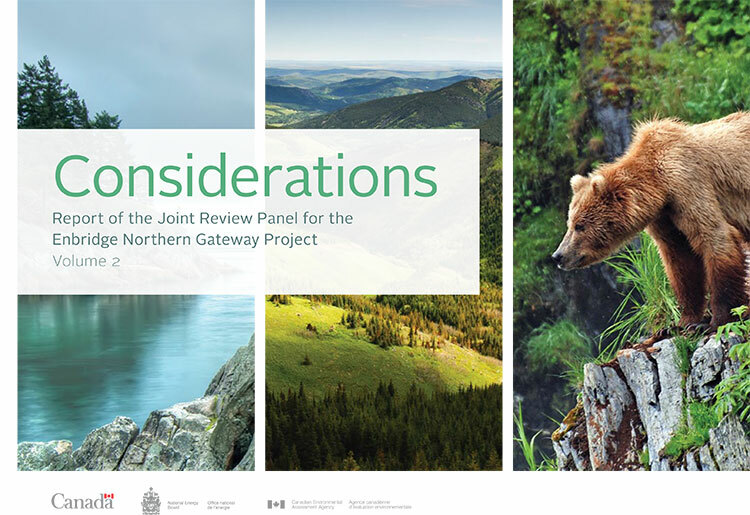 The JRP accepts, without much questioning, Northern Gateway’s assurances that environmental disruptions during construction will be minimal and that the chances of a major spill from either a pipeline or a tanker are minimal. Canadians as a whole may be better off with the Northern Gateway. Whether the people who live along the pipeline and tanker route will be better off is another question, one which the Joint Review Panel dismisses with casual disdain. There are actually two Joint Review Panel reports. One is political, one is regulatory. The political decision by the three member panel, two from Alberta and one from Ontario, is that the concerns of northwestern British Columbia are fully met by Enbridge Northern Gateway’s assurances. 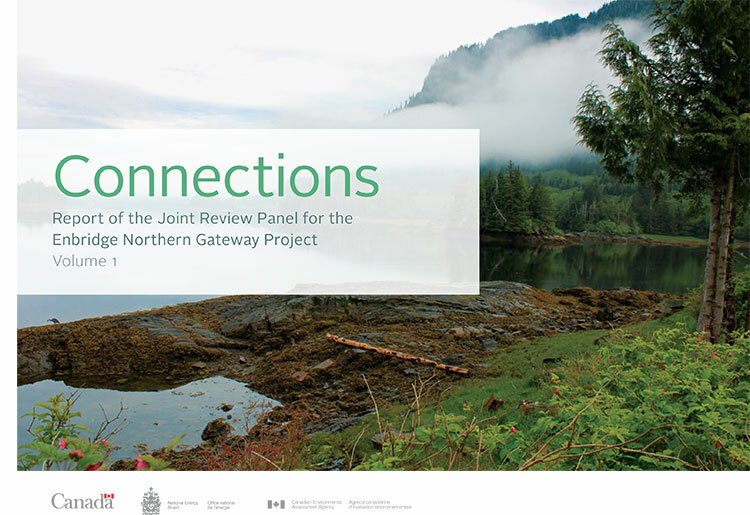 There is a second political decision, found throughout both volumes of the report, and the reader sees the Joint Review Panel has the notion that many parts of the environment have already been degraded by previous human activity, and that means the construction and operation of the Northern Gateway will have little consequence. Here is where the Joint Review Panel is blind to its own bias. 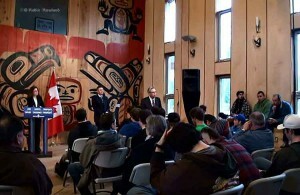 With its mandate to rule on the Canadian “public interest,” the panel makes the political determination that, in the Canadian public interest, northwestern BC must bear the “burden” of the project, while other political issues were not considered because, apparently those issues were outside the JRP’s mandate. …some people asked us to consider the “downstream” emissions that could arise from upgrading, refining, and diluted bitumen use in China and elsewhere. These effects were outside our jurisdiction, and we did not consider them. We did consider emissions arising from construction activities, pipeline operations, and the engines of tankers in Canadian territorial waters. If someone in Northwestern British Columbia favours the Northern Gateway project, if they believe (and many people do) what Enbridge Northern Gateway says about the economic benefits, then it is likely they will accept the burden and the further environmental degradation imposed by the Joint Review Panel on this region of British Columbia. If, on other hand, for those who are opposed to the project, then the decision to impose the burden on this region is both unreasonable and undemocratic (since no one in northern BC, in the energy friendly east or the environmental west has been formally asked to accept or reject the project). For those opposed to the project, the idea that since the environment has already been disrupted by earlier industrial development, that Canadians can continue to degrade the environment with no consequence will only fuel opposition to the project. As for the assertion that green house gas emissions were not part of the Joint Review Panel’s mandate, that is mendacious. The panel made a political decision on the role of the people of northwestern BC and the state of northwestern BC’s environment. The panel made a political decision to avoid ruling on the role of Northern Gateway in contributing to climate change or the larger world wide economic impact of pipelines and the bitumen sands. The Joint Review Panel is supposed to be a regulatory body and should be pipeline, terminal and tanker project go ahead after the expected court challenges from First Nations on rights, title and consultation and from the environmental groups, then those 209 conditions kick in. When it comes to regulations, as opposed to politics, the Joint Review Panel has done its job and done it well. If all 209 conditions and the other suggestions found in the extensive second volume of the ruling are actually enforced then it is likely that the Northern Gateway will be the safe project that Enbridge says it will be and actually might meet BC Premier Christy Clark’s five conditions for heavy oil pipelines across BC and tankers off the BC coast. The question is, however, who is going to enforce the 209 conditions? In recent conversations on various social media, people who were quiet during the JRP hearings, have now come out in favour of the pipeline project. Read those comments and you will find that the vast majority of project supporters want those conditions strictly enforced. Long before the JRP findings and before Premier Christy Clark issued her five conditions, supporters of the Northern Gateway, speaking privately, often had their own list of a dozen or two dozen conditions for their support of the project. The people of northwestern BC had already witnessed cuts to Fisheries and Oceans, Environment Canada and the Canadian Coast Guard in his region even before Stephen Harper got his majority government in May 2011. Since the majority government Harper has cut millions of dollars from the budgets for environmental studies, monitoring and enforcement. The Joint Review Panel began its work under the stringent rules of the former Fisheries Act and the Navigable Waters Act, both of which were gutted in the Harper government’s omnibus bills. Government scientists have been muzzled and, if allowed to speak, can only speak through departmental spin doctors. The Joint Review Panel requires Enbridge Northern Gateway to file hundreds of reports on the progress of surveying, environmental studies, safety studies, construction plans and activities and project operations. What is going to happen to those reports? Will they be acted on, or just filed in a filing cabinet, perhaps posted on an obscure and hard to find location on the NEB website and then forgotten? Will the National Energy Board have the staff and the expertise to enforce the 209 conditions? Will there be any staff left at Environment Canada, Transport Canada, Fisheries and Oceans and the Canadian Coast Guard where the conditions demand active participation by government agencies, or ongoing consultation between federal agencies and Northern Gateway? Will there actual be monitoring, participation and consultation between the project and the civil service, or will those activities amount to nothing more than meetings every six months or so, when reports are exchanged and then forgotten? Although Stephen Harper and his government say the Northern Gateway is a priority for the government, the bigger priority is a balanced budget and it is likely there will be more cuts in the coming federal budget, not enhancements to environmental protection for northwestern BC. The opponents of the project might reluctantly agree to the 209 conditions if Harper government forces the project to go ahead. It will be up to the supporters to decide whether or not they will continue their support of Northern Gateway if the 209 conditions are nothing more than a few pages of Adobe PDF and nothing more.